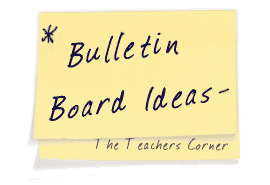 The Bulletin Board Materials page will provide you with new and creative ideas to spruce up your classroom bulletin boards. Ideas within the bulletin board materials pages includes ideas of how to use fabric and create interesting backgrounds. I love to use heavy duty foil as a background for a bulletin board I really want to POP. It takes a little longer to put up (my suggestion is to assemble all the strips on the floor, then attach to the wall); but it's worth it! It's unique, it's fun, it's eye-catching without overwhelming a room. It doesn't rip when you remove taped work- just beware of curious little fingers. With doing my first ECE placement a teacher had advised me to use Fluorescent Bristol Board. The children really enjoy it. "I use wallpaper for backgrounds on my bulletin boards. It's fast to put up, it doesn't fade and it doesn't show staple holes. In the summer, I look for wallpaper on sale. I prefer the tweed-like designs. I put wallpaper on my bulletin boards first thing in the fall and leave it up all year. If I really want a different background later, I just put it over the wallpaper. Then when I take the special background down, the wallpaper background is ready to go!" Submitted by: Jill Irey [email protected] a Spanish and Algebra II teacher at Lake City High School in Lake City, Michigan. This tip was published in the NEA's Weekly Tip Newsletter. I use plastic table cloths to cover my bulletin board. You can buy them at any dollar store. They come in a variety of colors, they're big enough, and cheap enough to tear off and throw away! One good piece of advice that I got is to put fabric on your bulletin board instead of paper. This will last the whole year and you don't have to worry about it ripping. Try laminating a printed fabric from the remnants table at your local craft store. Then, use your Ellison machine or whatever method you would like to cut the letters for your bulletin boards. It's a fun way to add a little variety to your boards. When I do a unit on newspapers, I always use a newspaper border. I cut 2 1/2 inch strips of newspaper and laminate them. I then staple them to the bulletin board as a border. I fill the board with articles and summaries the children have done.